Until fairly recently, I had no idea that organising museums according to their location could be quite so complicated. In the original proposal for the Mapping Museums project, we had stated that we would develop a database that would enable researchers to search our data according to a museum’s location and to visualise that information. For instance, a user could browse through all the museums in Yorkshire or see them marked as points on a map. That seemed reasonably simple. Why, then, did this task keep me awake at night? I now know that there were three key questions and areas of research, but initially, they blurred into one confusing mass. We needed to decide which boundaries we would use, how the database would be organised with respect to location, and to identify the datasets that would underpin the database and create map-based visualisations. We also had to think about the needs of different users. This blog looks back on why we initially struggled with location and the decisions we made about how to map our data. The situation becomes even more complicated within England, which is divided into metropolitan and shire counties, and unitary authorities. 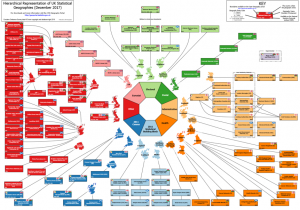 Greater London is its own entity and does not belong to any of the other groups. Each of those categories then further sub-divides. Whereas the administrative units in Northern Ireland, Scotland, and Wales have only a single tier, England has a more complex hierarchy. Metropolitan counties divide into metropolitan districts, shire counties divide into non-metropolitan districts, and Greater London into London Boroughs. Unitary Authorities do not have sub-divisions at this level. Table 1 makes this organisation clear. The local authority units are differently constituted in the four countries. However, to make the situation more complicated there are different kinds of administrative geographies. Depending on the public service (census, health, postal, electoral, etc. ), the territory of the UK is sliced up in different ways, as displayed in Figure 1. Units should be homogenous in terms of a target attribute (size of the resident population or something else). UK geographies like the Output Areas or the Local Authority Districts are designed to meet these criteria and are therefore suitable for statistical analysis (less so for spatial cognition). Interestingly, the European framework NUTS aims precisely at creating some order in the messy administrative geographies of EU member states, providing a useful way to think about their commonalities and differences across countries, many of which have similarly intricate administrative geographies (while allowing interoperability and harmonisation of statistical data across different countries). Choosing the appropriate geography for this project was therefore far from a trivial problem, and the most flexible approach consists of supporting multiple frameworks. Our solution was to identify the location of the museum as precisely as possible in terms of latitude/longitude, so that this location can then be used to assign the museum to any geographic unit., supporting different types of aggregation and analysis. The heterogeneous and asymmetric structure of the UK’s administrative geography also had implications for how we designed the database. We had originally intended that the search or browse facility for location would be arranged as a hierarchy of descending size or administrative importance. Following my investigations in administrative borders, I realised that there was no consistent hierarchy, and each country needed its own location logic to be defined. How then to proceed? Throughout the research, the project co-investigator Professor Alexandra Poulovassilis has adamantly argued that we should not simplify complex data when designing the database. The search and browse functions should be able to encompass and manage some of the messiness of organisation in the real world. Accordingly, our menu of location was organised according to the separate hierarchies of the country in question. A drop-down menu shows England, Northern Ireland, Scotland, Wales, Channel Islands and Isle of Man (the latter two entities are Crown Dependencies rather than part of England). Clicking on Northern Ireland, Scotland, Wales shows their district councils, councils, or unitary authorities as appropriate. 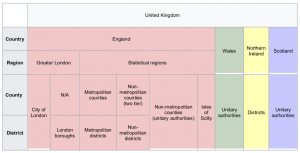 England subdivides into regions, then into a mixture of unitary authorities, counties and metropolitan counties, with the latter having the further sub-categories of districts. The region of London divides into the City of London and boroughs. Even though it is not symmetrical, this layout has the advantage of using recognisable sub-divisions, and of acknowledging the differences between the administrative geography of each country. Having decided to use an administrative geography and having agreed that we would not attempt to simplify the differences between the four countries, we then needed to find datasets that would facilitate the organisation of our data. Once again, this involved something of a learning curve and I now know that two types of datasets are required. The first correlates administrative boundaries with postcodes (which we’d collected for each museum) and thus links each museum to a district, council area or region as required. The second dataset enables that information to be visualised in the form of a map. Datasets that contain the coding for administrative boundaries and their visualisations are devised and available from several organisations, most notably the National Offices of Statistics. However, data collection and analysis within the UK is complicated by devolution. In some cases, the datasets cover two countries or even all four, but generally, the datasets relate to the individual countries of England, Ireland, Scotland and Wales, and to use non-computing terminology, these need stitching together. A further issue arose in that we needed to find a way to map our data, but we also wanted to import other kinds of data to inform our findings, For instance, we planned on importing census data and using that to make links between museums and the geo-demographic contexts in which they were founded. This meant that we had to choose datasets for locations that would be compatible with any datasets that we may use in the future. In short, we needed to know if we would import additional data in the future, and if so what. It was at this point that we realised we needed expert help and were fortunate enough to have Dr Andrea Ballatore a specialist in geographic information science join the team. He advised on how the different datasets could be combined and also recommended that we use the same administrative framework as the Office of National Statistics as this would allow us to cross-reference our data. Since then the process of mapping museums has proceeded much more smoothly. The problem of using current administrative geographies is that they are not always in common usage. For instance, I had not previously encountered English unitary authorities and would never think to look for ‘Liverpool City Region’ when I could look for ‘Merseyside’. The database had to support analysis (i.e. link museums to the correct administrative unit in order to generate accurate statistics) and thus we had to use the relevant geographies, but it also had to support spatial cognition (i.e. help users understand where a museum is using their prior knowledge of the UK). Our solution was to introduce a TownorCity field in the search pages. Users could thereby search by administrative area or on a more intuitive basis by towns or cities. © Fiona Candlin and Andrea Ballatore, January 2019.